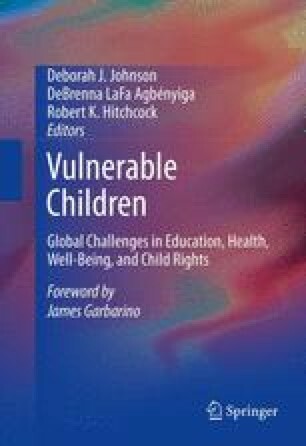 Emerging literature on the new humanitarianism, presented in this chapter, provides a lens to consider the work of transnational orphan care organizations. We draw on this literature to examine the images and discourses transnational orphan care organizations in Malawi use to enlist support for their endeavors. These include the websites, picture galleries, fund-raisers, and volunteer tours of orphanages that they purposely construct, using sentiments of compassion in order to enlist international contributors and volunteers in their activities. Our study draws upon research conducted during 2006 and 2008 in Malawi and the United States (USA). Government of Malawi (GoM) (2005). National plan of action for orphans and vulnerable children 2005–2009. The Republic of Malawi Government Document, prepared by the National Taskforce for Orphans and Vulnerable Children. http://sentebale.com/html/12067761.php. Sharra, S. (2006). From material girl to spiritual mom: Madonna, Malawi, and Baby David. Posted Tuesday, October 16, 2006 at http://mlauzi.blogspot.com/ Accessed June 10, 2010. Slate Magazine. (2007). Save the (celebrity) children! African family adopts Briteny’s kids. Retrieved from http://www.slate.com/id/2175303/ Accessed May 5, 2011. United Nations AIDS [UNAIDS]. (2004). Malawi: Country situation analysis. Retrieved from http://www.unaids.org/en/CountryResponses/Countries/malawi.asp Accessed May 5, 2011. United Nations Children’s Fund [UNICEF]. (2006). Malawi’s children: The missing face of AIDS. Lilongwe: UNICEF Malawi. Retrieved from http://www.unicef.org/malawi/resources.html/ Accessed May 5, 2011.